Two competing imperatives are in play here. The first is to avoid paying attention to preseason NFL games. They mean nothing, no result and no performance can be used to predict or extrapolate anything of value (and that some results and some performances do forerun regular-season success just proves the whole thing a crapshoot). Also, and this is more on an emotional level, I’m not ready for football to be a thing that’s back and here and talked about it. We’re about to have five straight months of football and nothing but football and I’ll enjoy it, but please, it’s still summer. The second imperative is to tell the world what I’ve been telling friends since he was drafted by the Chiefs 10th overall in 2017: Patrick Mahomes is going to be a star. I’ve never been so sure of anything. (This feeling exists entirely on an emotional level, because I sure as hell never watched him play in college [and college success only barely beats out preseason success for extrapolability to the meaningful NFL games]). I am reasonably certain that the root of my faith in Mahomes is a pre-draft highlight reel I saw once. So, no, this is not scientific. In fact, it’s probably more of a wish than a prediction? As in, I want Mahomes to be good, because if he puts it together in the pros, he’s the type of cannon-armed quarterback who will be truly fun to watch. The second imperative wins out here. Please, if you haven’t seen it, watch this bomb from Mahomes to Tyreek Hill, over the top of triple coverage for a 69-yard touchdown. And if you have seen it, you’ve already stopped reading this paragraph in a mad scramble to click play and watch it again. Good god, man. I didn’t know there was such a thing as a 69-yard touch pass, but with that placement and the relative ease of Mahomes’s throwing motion, I don’t know what else to call it. If it feels like you haven’t seen anything like this in a while, well, you haven’t. Mahomes’s throw traveled 68.6 yards in the air. That’s longer than any NFL pass traveled in all of 2017, including pre- and postseason throws. Mahomes’s arm strength obviously gives the Chiefs’ offense a new vertical dimension it didn’t have under Alex Smith. 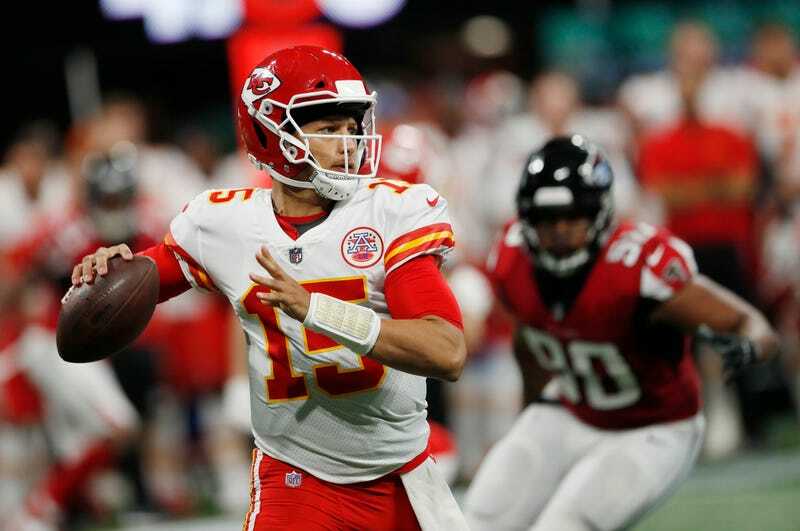 (KC’s decision to move on from Smith, a good NFL quarterback at a time there are only like 10 good NFL quarterbacks on earth, feels like more assurances that Mahomes is going to be for real.) But coach Andy Reid was equally taken by Mahomes’s accuracy into some nearer and smaller windows. The previous week, on the exact same play, Mahomes had muffed the timing and sailed the ball to Kelce. Not this time. Don’t forget you heard it here first 18,534th, folks: Mahomes is the real deal. And if I’m wrong, it’s not my fault. No person with a soul can watch the long pass and not get psyched. So watch it again. Goddamn.